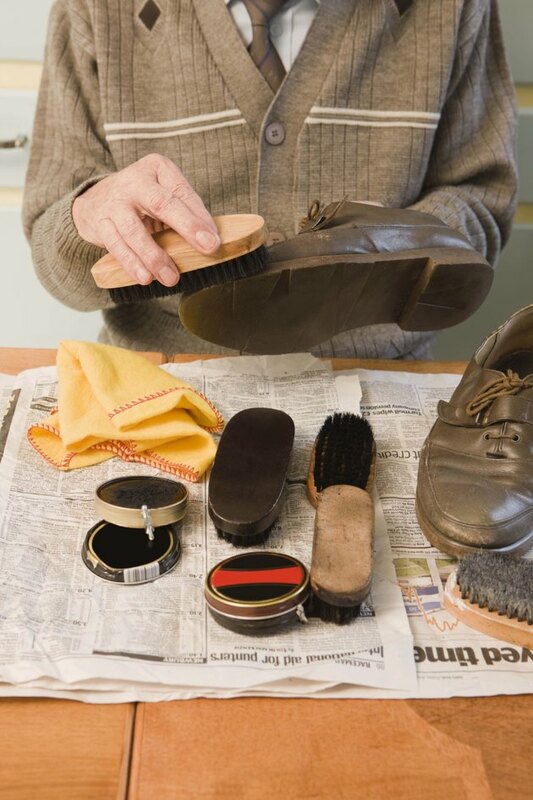 All shoes need frequent and basic cleaning to keep them looking attractive and in prime condition. When the insoles of your favorite pair of sneakers, flats or heels emit odor, you don’t have to throw them out. Because sweaty feet produce odor causing bacteria, the insides of your shoes will need a thorough cleaning to remove the smell. Using a few simple household tips and tricks, you can banish any odors and pamper your insoles easily with a little do-it-yourself TLC. Remove the insoles from your shoes. Place the shoes in a basin filled with warm water and mild liquid soap. Using an old toothbrush, apply the soap and water to the insoles. Scrub the insoles gently. For leather insoles, dip a small towel into the soapy mixture to clean with. Dry the insoles thoroughly with an old, clean rag. Place the insoles on a large dry towel in a cool place to dry for 24 hours. If your insoles are leather, keep them away from direct heat to keep them from cracking. Remove any lingering smells with odor-busting baking soda. Before bedtime, place a thin layer of baking soda on the top of your insoles with a spoon. Lay the insoles on newspaper with the baking soda facing up. When you wake in the morning, shake the powdery substance off the insoles before wearing. Add a sweet smell to your insoles with a clothes dryer sheet. Cut the sheet in half. Stuff one half in one shoe, and the remaining half in the other shoe. Let the sheets remain in the shoes overnight to allow the scent to transfer from the sheet to the insoles. Keep your feet clean and dry. If your feet get sweaty easily, wear thick cotton socks with your sneakers to absorb any odors and moisture. Also wash your feet daily using a foot brush and soap to remove any bacteria from in between your toes and on the tops and soles of the feet. Don’t wear the same pair of shoes every day. After every two wearings, remove the insoles and allow the shoes to dry in a cool place away from heat. Do not use the washing machine or dryer to clean your insoles.